I just saw this too Alpine! Besides Shawn's latest video about Cameron Champ, here's a driver swing analysis of him . . . Besides his unrestricted turn in the backswing, notice the incredible amount of hip turn/rotation that he has well before impact! Very good, was not able to include this video same way as Shawn‘s video, but it is already there, the tiny link. but now it is visible much easier, thank you. The many quotes are pure gold. What do you think about the hips in the throughswing? Tested that in the net in the backyard and had a terrific powerful feeling. I was close to loose my good focus and had some tendencies to hit at the ball, but I had plenty of room for my arms and achieved a stable finish. Sorry, I didn't notice the link . . . I just saw Shawn's video first, and then I did a search on YouTube for Cameron Champ and found the other one. Yes, his hips in the throughswing are incredible . . . I guess the key is having the arms synced up with that turn. That said, I don't think there are many people who can clear their hips in the throughswing like Cameron. Amazing that at impact , he looks a lot like Bubba and he could be what's called a 'Reverse Foot' golfer . It would be interesting to see his and Bubba's COP trace to see if their weight pressure moves from their front leg to rear leg in the late downswing into impact (like Justin Thomas - another big hitter). From some of the articles I've read (unsure how true this is) , he is already experiencing some back problems even at the tender age of 23. Texas A&M senior Cameron Champ, making his grandfather proud, is shining on the U.S. Open stage at Erin Hills. Bulging discs sounds really serious for someone so young. With regards Cameron being poster boy for WIG , maybe yes for the backswing but imho, no for that massive X-factor on the downswing . Cameron has already rotated his hips to its maximum way early as his club reaches horizontal on the downswing creating massive X factor strain in his lower back (ie. too much separation between his pelvis and upper torso). He is not rotating his upper torso on that pelvic 'turntable' like Shawn does (whose driver distance seems remarkably long - both lefty and righty). Wonder if this is the reason why PGA men drive the ball further than LPGA even if the men have, 'on average' , less hip/ribcage' speed than the women? If true , then it means that X-factor stretch (ie. muscular strength) may somehow play a factor in increasing clubhead speed. Last edited by Schrodinger; 10-31-2018, 12:11 PM. No, it’s natural. If I would be a women, I would hold the world record in javelin with 94m, 103 yards. In Germany I was top 20 for men, but the best were far away. The abilities between both genders are huge. Similar distance gap we can observe in golf. Interesting article on the "X-Factor" stretch Schrodinger! Also, just thought I would include the link to an old Shawn video (from 2007) where he talks about the "X-Factor" and explains why he doesn't advocate it for the backswing. However, he also explains how there is an "X-Factor" stretch in the downswing, and this stretch varies depending on how assertive you are with the downswing, i.e., the lower body will lead accordingly, and you will naturally get more of an "X-Factor" stretch with a more assertive swing. I know the controversial discussion of McLean‘s X-factor very well, and that he himselve rowed back and emphasized, that the x-factor is not for the back swing, it is a ‘x-factor STRETCH‘ in the down swing. What we don‘t know, is, whether the enournous early and open hip move of Cameron is a result of Foley‘s teaching, or natural. Anyway, I am pretty sure this guy has a flexibility here, we normal and old golfers don‘t have. Yes Shawn has that analogy of the riding on the turntable. Isn‘t that to illustrate the backswing sequence? For the downswing he likes to empasize the kinematic chain, and my interpretation is, knee before hip, hip before shoulder. It is not conscious, but I don‘t believe, these body parts should be synchron​​​​​​ously. Yes, if its natural and not contrived , he might limit further damage to his discs. Perhaps MARCUS should be "WIG Poster-Boy"? As valid and concise points as have ever been made on this Forum! (...imagine if English was your FIRST language? IMHO, we get our leverage for our rotation from the ground-up. Just makes sense that the knees would participate before the joints ABOVE them? I've always loved the "turntable" analogy. But, I've always kind of thought of it as a GUMBY turntable?? Kind of like "wringing out a towel"? You start at one end and work to the other. If you "wrung the towel" such that the entire length of the towel turned at the same time, you'd live with a wet towel for a long time. The reason the "turntable" image works on the BACK-swing is that we're not attempting to exert lots of ENERGY moving to the REAR? And the additional ENERGY that we exert on the way THROUGH (...geez, I hate that term "DOWNswing"?) COILS the torso naturally. Yes, I agree Marcus....it is NOT "conscious". I always believe that we over-think too much stuff already. I'm really glad that you're still out there. looked at Champ's swing - I think the potential back injury or bulging discs occurs in his downswing.. or throughswing.. seems like he clears his hips beautifully and appears to be trying to hold his upper body over the ball ..maybe holding an angle or something.. it appears that the additional energy that can't be contained shows just below his neck and above the tops of his shoulder blades..
not saying that's it.. but I would look there first ..
agreed about the backswing and the through swing is completely dependant on his awareness to strain; he has talked about hitting hard, so let’s hope it’s not too hard and he does not get goated into hitting it farther! Sorry about the dust in/on your locker... I'll get right on it. Add MY best Thanksgiving wishes to all of our American members at Crackpot National. Been spending too many hours reading up on golf articles again and was directed to a free website containing articles by a gentleman called Ben Allen Jnr. Quite an interesting twist on the reasoning behind the evolution of the modern swing from Harry Vardon to Cameron Champ. I was finding his prose style quite difficult to follow (in any scientific sense) but I am slowly getting used to his unique terminology (and other opinions). If you are interested and have many spare hours during the winter nights , the link is below (you can read all the .pdfs but I don't think you can download them without registering on facebook or google). His analysis of Cameron Champ vs Sandra Carlborg (Womens Long Drive champion for several years) is quite interesting but again difficult to read without getting accustomed to his golfing terminology. 2. That when the steel shaft replaced hickory , golfers implicitly found a way to maximise power during transition, retaining that power until release using a specific body action, and then basically the rest of the body movements (in the downswing to impact/follow-through) were actions to 'keep their hands up' with the pull of the clubs momentum and keeping the clubface square to clubhead path. 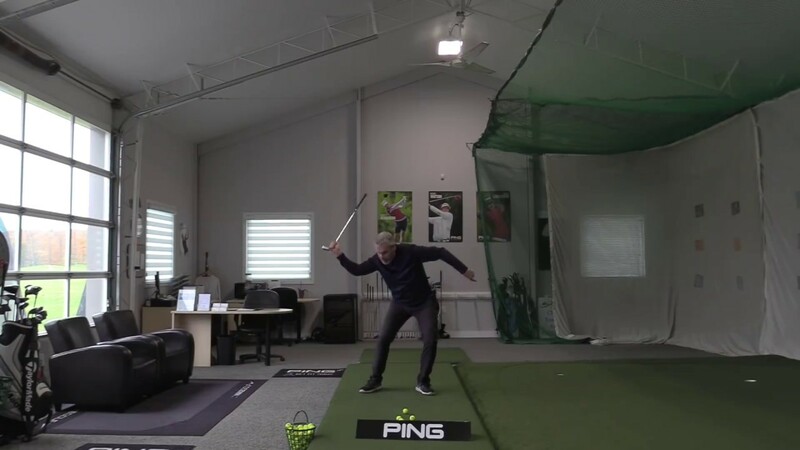 So in essence the 'modern golf swing' is all about 'power' moves being done very early in the transition and mid-downswing, something that recreation golfers do not do. 3. The modern swing golfers did point 2 above 'because they could' without breaking the steel shaft (unlike hickory) and creating superior clubhead speeds by physical effort, but that also meant the creation of something he calls the 'Geometric Curse' . That 'curse' is the strain they put on their lumbar spine regions by excessive lateral flexion approaching/through impact (ie. trying to keep the clubface square to the clubhead path to and through impact for at least a few inches). 4. He claims that Harry Vardon and others of that era , used power sequences later in the downswing and also rolled the club over through impact without the need for excessive lateral flexion. That those more efficient and body friendly mechanics were forsaken for the modern golf swing with the advent of steel shafts. 5. He has proposed a re-engineered golf swing to prevent 'golfers elbow' and lumbar strain while still being able to create clubhead speed by shaft power loading sequences later in the downswing including a pausing of the left arm movement while using a rolling of the wrists/clubhead to/through impact to create a 'burst' of clubhead speed (using centripetal acceleration). All quite interesting but found his re-engineered golf swing unnatural and the physics behind his claims very confusing (and unconvincing). But hey, yet another different spin on the cause and effect of a golf swing.